Volcanic hot spots and auroral emissions glow on the darkside of Jupiter's moon Io in the image at left. The image was taken by the camera onboard NASA's Galileo spacecraft on 29 June, 1996 UT while Io was in Jupiter's shadow. 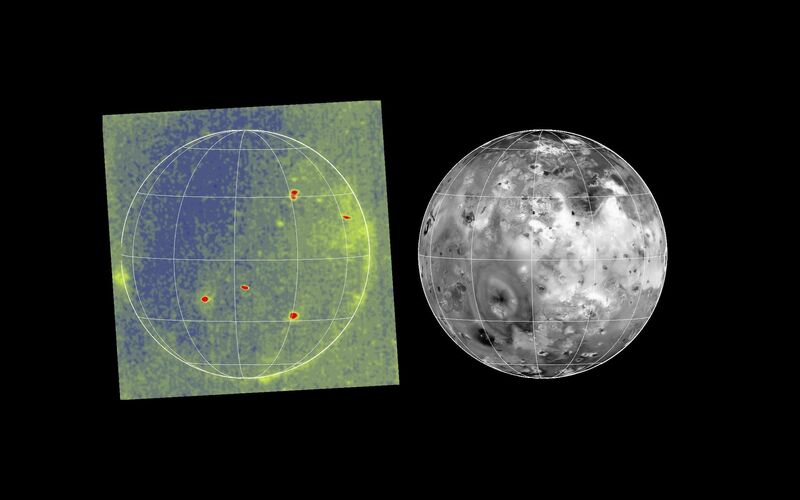 It is the best and highest-resolution image ever acquired of hot spots or auroral features on Io. The mosaic at right of 1979 Voyager images is shown with an identical scale and projection to identify the locations of the hot spots seen in the Galileo image. The grid marks are at 30 degree intervals of latitude and longitude. North is to the top. In the nighttime Galileo image, small red ovals and perhaps some small green areas are from volcanic hot spots with temperatures of more than about 700 kelvin (about 1000 degrees Fahrenheit). 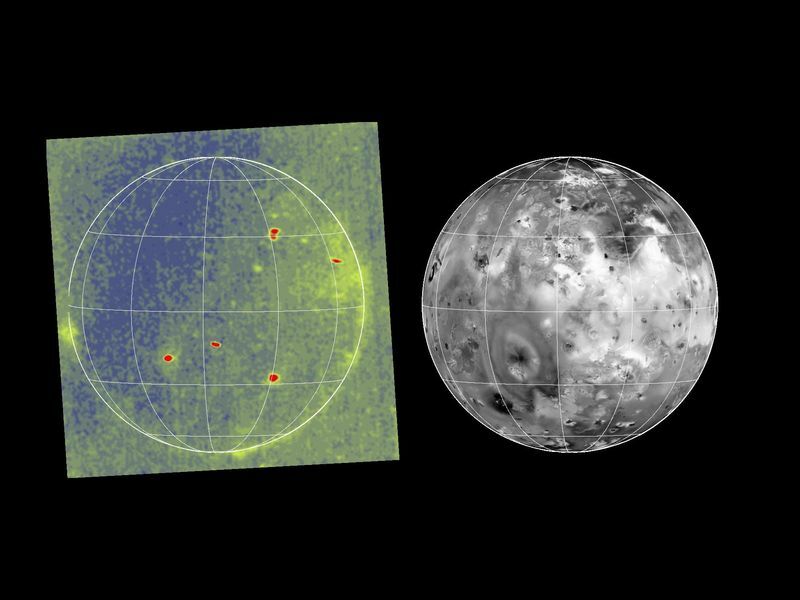 Greenish areas seen near the limb, or edge of the moon, are probably the result of auroral or airglow emissions of neutral oxygen or sulfur atoms in volcanic plumes and in Io's patchy atmosphere. The image was taken from a range of 1,035,000 kilometers (about 643,000 miles). This image and other images and data received from Galileo are posted on the World Wide Web, on the Galileo mission home page at http://galileo.jpl.nasa.gov. Background information and educational context for the images can be found at http://www.jpl.nasa.gov/galileo/sepo.